TSPSC RJC PDs Final Selection list Results (Residential Junior Colleges): On the basis of the results of the Main Examination held on 13/05/2018 FN and Oral Test (Interview) held on 14/11/2018 at TSPSC Office, Hyderabad, 08 candidates with the following Hall Ticket Numbers have been selected 8against 08 vacancies for appointment to the post of Physical Director(Junior Colleges) in MJPTBCWREIS vide Commission’s Notification No.26/2017, Dt:02/06/2017, the selections have been verified and published here-with subject to the following conditions. 1. That success in the Examination confers no right to appointment unless the appointing authority is satisfied after such enquiry as the case may be considered necessary that the candidate having regard to his/her character and antecedents is suitable in all respects for appointment to the service. 2. That the candidates are found physically fit for the post. 3. That the candidates should produce such original certificates as required in accordance with the Rules / Notification. If it comes to the notice of the Commission at a later date that any candidate furnished false information or the selection is not in order due to any act of omission or commission of any candidate , then his/her provisional selection is liable to be cancelled at any stage and he/she will forfeit all consequential benefits including that of selection, besides that the Commission reserves the right to take any action as it deems fit in the circumstances of the case, in terms of the various provisions as notified in the Notification No. 26/2017. On the basis of Main Examination held on 18.05.2018 & 19.05.2018 for the Post of Degree College Lecturers in MJPTBCWREIS & TSWRDC vide Notification No. 22/2017,1473 candidates with the following Hall Ticket Numbers are called for Certificate Verification against total No. of 546 vacancies. The Certificate Verification is scheduled to be held from 28/08/2018 onwards. Day wise schedule &venue will be announced shortly . 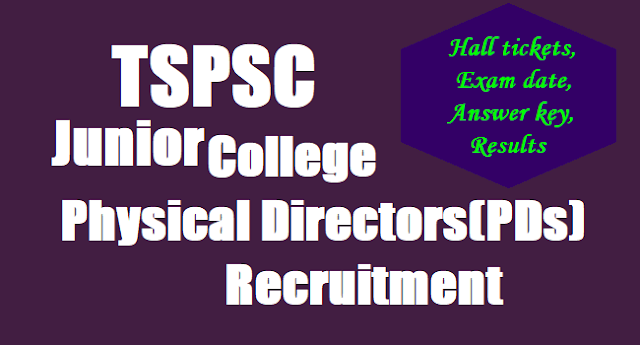 Degree College Lecturers, Physical Directors in Degree Colleges, Librarians in Degree Colleges, Physical Directors in Junior Colleges, Junior College Lecturers & Librarians in Junior Colleges, vide Commission’s Notfn Nos. 22/2017, 23/2017, 24/2017, 26/2017, 27/2017 & 28/2017:: TSPSC has conducted Main Examination for the above notifications from 12/05/2018 to 19/05/2018. The Final Keys of these notifications will be available on TSPSC website from 01/08/2018. No further objections will be received on Final Keys. 1 Physical Director (Junior Colleges) in Mahatama Jothiba Phule Telangana Backward Classes Welfare Residential Educational Institutions Society. A Bachelor of Physical Education(BPED) OR Bachelor of Physical Education (BPE) OR Bachelor of Science(B.Sc) in Health and Physical Education and Degree in Sports with atleast 55% marks, as per National Council for Teacher Education (Recognition Norms and Procedure) Regulations, 2009. In case of SC/ST/BC/ Differently abled candidates, the minimum marks shall be 50%. OR Atleast 50% marks in the B.P.Ed Degree/B.P.Ed(Integrated) 4 years professional Degree in accordance with the National Council for Teacher Education (Recognitions Norms and Procedure) Regulations, 2007 notified on 10/02/2007. In case of SC/ST/BC/ Differently abled candidates, the minimum marks shall be 45%. OR B.P.Ed with atleast 55% marks or B.P.E course( or its equivalent) of 3 years duration with atleast 50% marks in accordance with the National Council for Teacher Education Regulations, 2002 notified on 13/11/2002. In case of SC/ST/BC/ Differently abled candidates for B.P.Ed, the minimum marks shall be 50% or for B.P.E Course, the minimum marks shall be 45%. AND M.P.Ed., of at least 2 years duration from any National Council for Teachers Education recognized institution. Application fee:(Remittance of Fee) Each applicant must pay Rs. 200/- (RUPEES TWO HUNDRED ONLY) towards Online Application Processing Fee. Mode of Payment of Fee:The Fee mentioned at Para-I(5)(a) is to be paid online through SBI ePay duly following online instructions once the application form details are submitted by filling TSPSC ID, date of birth and other particulars. Hall tickets:Hall Tickets can be downloaded 07 days before commencement of Examination. version only. The question paper of Main examination will be supplied in English version only except languages. The Main Examination (Objective Type) is likely to be held on 12 OR 13/08/2017. The Commission reserves the right to conduct the Examination either COMPUTER BASED RECRUITMENT TEST (CBRT) or OFFLINE OMR based Examination of objective type. The candidates who applied for the posts of Degree College Lecturers (Notfn. No.22/2017),Physical Director in Degree Colleges (Notfn. No 23/2017), Librarian in Degree Colleges (Notfn. No 24/2017), Principals in Junior Colleges (Notfn. No 25/2017), Physical Director in Junior Colleges (Notfn. No 26/2017), Junior Lecturers (Notfn. No 27/2017), Librarian in Junior Colleges (Notfn. No 28/2017) and Principal Schools (Notfn.No 29/2017) are hereby informed that, the Preliminary Examination (Screening Test) is rescheduled to Dt:30/07/2017 due to Bonalu festival in Hyderabad.